Not since Gerry Mulligan and Chet Baker’s collaborations have I been excited to hear a trumpet and baritone saxophone creating small ensemble jazz. 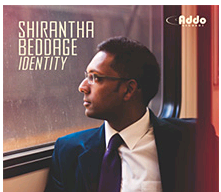 But is this album is a worthy successor to Shirantha Beddage’s 2006 album “Roots and Branches“? Six years have passed since the “Roots and Branches” album and Beddage’s tone and tastes have matured and become more refined. It is easy to hear that his sound as a whole has become a part of who he is more completely than it was in 2006. This has manifested itself as the most baritone-like tone I’ve heard in a while. It is intensely clean and clearly discernible as a baritone saxophone on every note and in every register. In fact, if I had students I would be hard pressed to choose between Beddage and Brian Landrus as an example of what a powerful and modern bari tone could be. Variety seem to be a pattern with Beddage’s composing style, there are wide variations in the style of each song. This has the effect of leaving you curious about what is going to be next. Also a trademark of his composition style is the length of his pieces. He gives ample time for his thoughts and feelings to play themselves out throughout each piece. This gives the listener time to connect to each piece in a uniquely personal way that is difficult when a piece is too short or the individual improvised sections occur to rapidly. His use of time, tempo, and rhythm as the 6th member of the group really makes this album standout in my collection. The only other baritone player I felt really used time and rhythm well is Ronnie Cuber. This album has some of the hippest grooves I’ve heard on a jazz album in a while. The listener can’t help but bop your head along with the rhythm section on Winds of Change and Pyramid Scheme. These pieces are pushed along by the driving rhythm section. This forms the backdrop for Dave Restivo’s passionately playful piano and Rhodes solos. Of course Restivo isn’t working alone here, on bass is Mike Downes. His playing is exactly what you would want from a bass player. He keeps the groove going, supports the improviser and serves as the harmonic foundation of the group. He is both visible and invisible in the groups sound. I would be remiss if I didn’t describe Nathan Eklund’s contribution on the trumpet. His sensitivity as an artist is evident in every phrase and every note. Through out this album he plays with passion, precision and consideration while never stepping on the rest of the band or trying to steal the spotlight. After all he has his own project, The Nathan Eklund Group to fulfill his spotlight needs. Personally I would have loved to hear him on the Flugelhorn on the tracks he is on. His Flugelhorn tone is in inviting mix of Miles Davis and Chuck Mangione. Take Away: This album is replete with musical gems, interesting quotes, and introspective composing. I recommend purchasing this album, twice if you have friends who may want to borrow it. If I could change or add anything to this album it would be a Blue-Ray “making of” movie or a downloadable concert video. On Further Consideration: Despite my glowing opinion of this album I recognize that it is not all things to all people. It is a well-made album of modern compositions and neither Carney, Brignola, Adams, nor Mulligan reside here. I feel that there are at least 2 future jazz standards on this album: Pushin’, and Winds of Change come to mind most immediately.